The Mariners put no timetable on his return to the mound or when he will even pick up a ball and resume throwing. 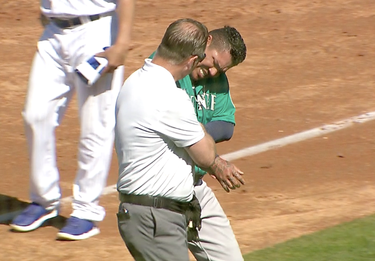 PEORIA, Ariz. — Given his arms and the array ink that is permanently adorned on them now, the odds of that line drive that struck Felix Hernandez in his right forearm on Monday not hitting at least one specific tattoo were pretty slim. That the tattoo the highly superstitious Hernandez pointed to was of a star with a No. 13 — signifying his 2013 all-star selection — well that just writes itself. “I know, right?” Hernandez said on Tuesday morning. Lucky or not, that No. 13 is the starting point of all the swelling and pain his right arm. Hernandez noticeably winced when he tried to straighten his arm out or flex it in a curl motion. With some ice and electronic stimulation treatment on Monday evening, some of the swelling has gone down. But the pain has not receded. “It’s been sore since it hit me,” he said. Hernandez knew the moment that Cubs catcher Victor Caratini hit the ball that he was in trouble. The ball came screaming off his bat and he had no chance to get out of the way. The ball hit Hernandez and he staggered off the mound in obvious pain, grabbing at his arm. While manager Scott Servais, pitching coach Mel Stottlemyre and trainer Rob Nodine rushed on to the field to see if their pitcher was okay, Hernandez’s brother, Moises, thought something different. Caratini reached out to Hernandez via direct message on Instagram. The good news for the Mariners is that the x-rays came back negative and it’s only a deep contusion. But it still sidelines Hernandez for a while. “Bad thing is I was feeling good yesterday, I was throwing the ball really good,” he said. Indeed, Hernandez looked sharp in a 1-2-3 first inning that included strikeouts of Javier Baez and Anthony Rizzo. He has been working on finding consistency with his mechanics as well as changing up a few things on his delivery to disrupt hitters’ timing. Hernandez’s status is officially “day-to-day” from the Mariners. Much was made by the Mariners about getting Hernandez into his throwing progression earlier than past spring trainings. The plan was to get him more sound mechanically with more bullpens and Cactus League outings. He was starting to see results from the plan. But now it’s been put on hold. He vows to be ready for the regular season.